Thousands of Ponies past, present and future came together to celebrate Homecoming 2018. This year’s homecoming week was packed full of fun for residents of the entire district. 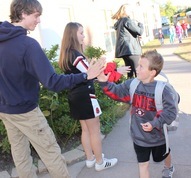 High school students traveled to elementary schools to greet students on Friday as part of Pony Pride Day. Two residents of Boutwells Landing were named 2018 Senior Homecoming Royalty by the high school's student council. In its second year, the Pony Homecoming Carnival drew big crowds to the high school. Thousands of people attended this free event, which featured carnival games and activities, musical performances, food trucks and concessions and much more! See more photos from Homecoming 2018 on Facebook. School board meetings will be held at the former Oak Park school starting with the Oct. 11 meeting. See the updated meeting calendar. As always, meetings are open to the public and you’re invited to join us! The former media center will be home to the board’s chambers. This new location provides a more informal and welcoming meeting venue for community members to stay connected with the board. Can’t attend meetings in person? School board meetings will continue to be broadcast on Valley Access-TV cable channel 15 as well as online. You can watch meetings live or catch up on an archived meeting online. School board members will hold a work session on Oct. 10 to continue conversations about the district's current $2.5 million budget shortfall. The retreat will be held from 8 a.m. to noon at Central Services at 1875 Greeley Street South in Stillwater. The board expects to engage in discussion about possible budget reductions, as well as consider other financial and facility needs. See the official meeting notice. Students and staff at Brookview Elementary School are learning about the world and its many languages and cultures by simply recognizing the people around them. 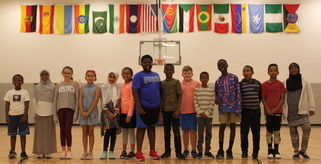 With one of the most diverse student populations in the district, Brookview's Language and Culture Club is letting students become teachers as they celebrate what makes them unique. Read more. Three young people in Nigeria are able to attend school thanks to the efforts of nearly 50 students at the high school. As part of the BIZAA (Basic Institute for Zonal African Advancement) Club, which formed last spring, SAHS students are sponsoring three children in Nigeria - providing them with clothes and shoes and an opportunity to attend school. Read more. Want to learn more? Join students from the BIZAA club at 6:30 p.m. on Saturday, Oct. 6 in the high school auditorium. BIZAA’s founder will share his inspiring story. Admission is free. Reserve a seat. 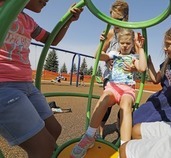 Lake Elmo Elementary is home to a new inclusive playground that allows all students the chance to play side by side. The structure includes equipment that is more accessible to children in the school's medically complex program. A big thank you to the PTA, volunteers and donors who helped make it happen! Read the Star Tribune article. Parents of middle school and high school students are invited to join us on 7 p.m. on Wednesday, Oct. 10 in the auditorium at Stillwater Area High School for an important discussion regarding students' use of e-cigerettes and vaping. Please RSVP to attend. The use of e-cigs and vaping has been deemed an emerging public health threat, and recent statistics show one in four students at Stillwater Area High School have used an e-cigarette in the past 30 days. During the meeting we'll learn more about the dangers of e-cigs and vaping and discover what you can do as parents. We'll also ask for your help in determining the best way to address the problem with our students. Hosted by the St. Croix Valley Chapter of Minnesota Council for the Gifted and Talented. Review the Candidate Questionnaire Responses.